Millions of people have smiles that include crowding, gaps, or another type of “dental misalignment,” such as an underbite, overbite, or crossbite. These bothersome concerns can mar the beauty of a smile and be the cause of functional issues. At Saco River Dentistry, we offer an innovative treatment that can help straighten teeth with greater comfort and discretion than ever before. Invisalign uses a series of clear, removable aligner trays that can gradually shift the position of the teeth. As a result, these “braces” are well concealed and can be taken out to eat, drink, brush, floss, and for special occasions. Our experienced cosmetic dentists can help you determine if this procedure is right for your needs and goals. One of the many benefits of Invisalign is its ability to address a wide range of concerns, making it appropriate for most patients. If you suffer from gaps, crowding, overbite, underbite, or crossbite, Invisalign can often help. During your initial evaluation, our dentists will review your needs and goals to determine if Invisalign is right for you. Original Invisalign is ideal for adults, and our adolescent patients have their own personalized option in Invisalign Teen. If you’re trying to decide between traditional metal braces and Invisalign, there are many reasons to consider this innovative new approach. In addition to being unnoticeable and removable, treatment time often is shorter than with braces. Teens have their own version designed just for their unique needs. While Invisalign is not right for everyone, and each case must be determined based on the individual’s anatomic needs and desired outcome, it can help correct many issues that previously required braces. Invisalign Teen is just like Invisalign, except it is made to suit the special orthodontic needs of adolescents. If you have a teenager who needs bite correction or has misaligned teeth, Invisalign Teen offers a more comfortable and inconspicuous approach to teeth straightening than traditional braces. Metal-free parts and removable aligners also add to this treatment’s appeal. Everyone loves a beautiful smile, and with Invisalign Teen, your child no longer has to sacrifice to achieve that stunning grin. At our practice, your care is always our first priority. When you arrive for your initial consultation, one of our dentists will examine your teeth, discuss your concerns, and develop a customized treatment plan. To provide the most precise fit and optimal outcome possible, we will begin by taking an impression of your bite. From this mold, a series of clear aligners will be fabricated to achieve your goals step-by-step. Each tray is designed to reposition your teeth a small amount, progressively shifting each tooth into the final location. Each aligner is worn for about two weeks before moving on to the next one in the series. You should remove the appliance for eating, drinking, brushing, and flossing; however, it should be kept in place as much as possible at all other times for the most effective results and briefest treatment time. Just as your smile is unique to you, so too will be your treatment plan. Most patients can achieve the discussed outcome in about 9 to 15 months. Depending on your singular needs, that estimate may be longer or shorter. Our dentists will provide a more specific timeframe during your visit. 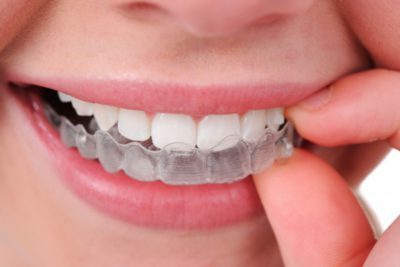 While Invisalign is not appropriate for every patient, this procedure can address a wide range of mild to moderate alignment issues, and it may be able to help you achieve the smile you’ve always wanted. The price of Invisalign is often comparable to traditional metal braces. The cost of treatment can vary depending on your individualized treatment plan and particulars. Our patients typically pay around $6,100, although your program may differ. We will review the total cost with you at your initial consultation so you are well-informed before starting treatment. To help keep costs down, we recommend wearing your aligners diligently as directed and taking good care of your oral health with regular brushing and flossing. For more information, including details on orthodontic financing, please reach out to our team. We want to help you make the best decision for your needs, goals, and lifestyle. For more information about Invisalign, or to schedule a consultation with one of our Saco River Dentistry doctors, contact us online or at (207) 929-3900.